The fun aspect of LEGO is the wealth of creativity it can inspire in people all over the world. With the focus of Musical Brick’s custom LEGO models and minifigures it has been a joy to receive pictures of various creations. Michael Pellerin (USA) has customised the Live 1973 stage set to include lights! Wow! See the construction here. 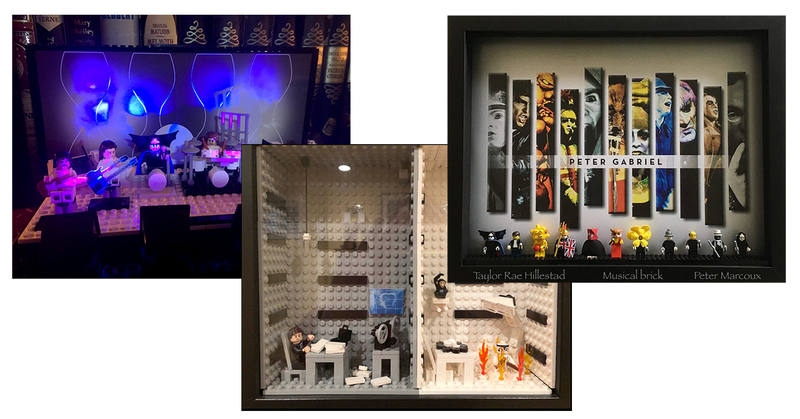 Brett Pangburn (USA) used the Shock the Monkey minifigures to create this amazing shadow box frame. Peter Marcoux (Canada) used a fantastic graphic created by Taylor Rae Hillestad to incase the minifigures within a shadow box frame. Andrew Stanton (USA) had this miniature monitor stand built by Angus MacLane to place the minifigures on. Mickey Wedo (USA) Has populated the empty concert venue with an ecstatic crowd!